I’ve lived in New York for like a month now so I know pretty much everything there is to know about the city. Here’s what literally no one told me about the capital of America. If you draw a line up and down you can figure out the city pretty well. Central Park is small, comparatively. All the neighborhoods are acronyms based on Rob Reiner movies. The city actually has a bridge called Dumbo where the movie was filmed, which is cute if you think about how New York is the city where dreams fly and hopes die. Another neighborhood is called SoHo, which stands for South of The Hamptons, and extends to D.C., which is easier to get to than some boroughs. There’s a neighborhood called Brooklyn across the river where all your friends live. For the life of me I can’t find a single blog detailing the intricacies of Brooklyn living. True story: I once got offloaded in Brooklyn after taking the wrong train and ended up getting a slice of pizza. To find when the next train is coming lean over the edge and stare down the vast tunnels into the emptiness beyond and mind contemplate everything that has brought you to this moment in your life. When did everything go so wrong? Stop, the train has arrived. There is an IRL show called based off your friend’s Spotify playlist, but you will never get tickets. Every single person has a dog. Five million people living in New York and five million dogs. Do the math. I pet random people’s dogs all the time like New York City is a free petting zoo or something. There are a lot of small moments like that which will live on after you. There are a lot of humans. You will never meet a single person who owns a car. 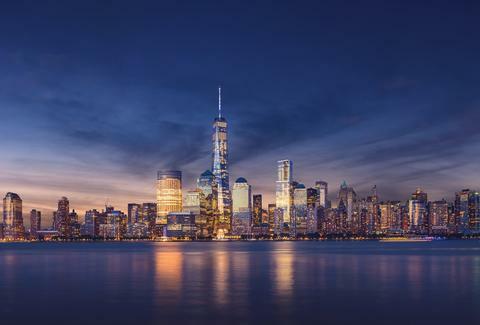 Interestingly, New York is not the City of Lights, but there are a lot of lights. No one has asked me yet how much it would cost to wash every window in the city, but I know the answer. I’m ready Google recruiting. PBR is the same price you pay anywhere in the country. There are these shops called bodegas on every street corner that are open 24 hours a day like it’s Vegas or something. There’s a Taco Bell in Penn Station if you want some food. A few blocks up there’s like an outdoor mall called New York Times Square that has the same restaurants you would find in an Indiana food court. If this is a Kitchen in Hell, sign me up. There are celebrities everywhere. I saw Trump on a building. I think Zach Woods ate brunch near me once. He was tall and seemed kind. Aziz Ansari wrote a show that takes place in New York. All your friends have more important things to do than hang out with you. Everyone in New York is nice. If you think New Yorkers are mean, maybe you should do a deep dive pizza into your own life. Are 20 million people wrong, or are you? Maybe you should wait for people to get off the train before you board, Carl. Why did you just stop at the top of the escalator? What are you doing, Carl? Correction: I’ve been informed by a person that it isn’t possible to know everything about New York City given my timeframe here of one month. Correction: Apparently there is not a single neighborhood in New York named after a Rob Reiner movie. Neighborhoods are mostly named based off real estate endeavors to inflate interest in an area by giving it a kitschy name. Correction: Dumbo is not the name of a bridge, nor was the animated Disney film shot on a bridge. 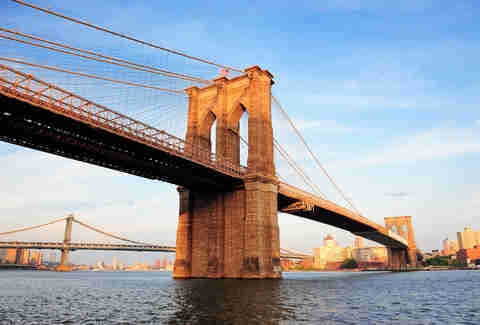 The name of the bridge is The Manhattan Bridge and the picture below this is the Brooklyn Bridge. DUMBO is the name of a neighborhood where a bunch of design firms reside. It stands for Down Under the Manhattan Bridge Overpass. Correction: SoHo apparently has nothing to do with Long Island’s seaside communities, but instead stands for South of Houston (pronounced like the Texas City), which is a street that has good bagels. Also, SoHo does not extend to DC. It’s just like a few blocks with a bunch of department stores. Correction: Houston is not pronounced like the Texas City. It’s pronounced how-sten. Correction: Not everyone’s friends live in Brooklyn. Correction: At least one person has seen Hamilton. Correction: Some people don’t have a dog, but I think the math is still accurate because some people have two dogs. Correction: The math is not accurate. There are apparently something like 8.4 million people who live in New York City, not 5 million, and only 600,000 dogs. Correction: It turns out several people are named Carl. Yuri Victor is an engineer for the Vox Media Storytelling Studio. He loves you.